Congratulations to Rick and everyone at All Points! We are proud to report we have been named as a top 75 company in the upcoming Inbound Logistics Green Supply Chain Partner list. The June issue of the magazine profiles companies that “walk the walk” when it comes to commitment to supply chain sustainability. Click here to view the G75 Article. Albert Evans Sr. founded Evans Delivery in 1939. Without the benefit of a high school education, he created a successful organization that is thriving over 70 years later. He was a strong believer in the importance of education and thus, in his honor and memory, the Evans Network of Companies is proud to annually present the Albert L. Evans, Sr. Scholarships. . Since its inception in 2007, the scholarship fund has awarded over $27,000 to sons and daughters of Evans Network of Companies employees and partner agents. Four more students will benefit from Albert L. Evans, Sr. Scholarships when they head off to college this fall. The 2011 recipients are Emma Owen, daughter of Richard Owen, night dispatcher at West Motor Freight; Dania Roach, daughter of Woodstock, Georgia independent contractor Aston Roach; Malorie Fink, daughter of Single Point of Contact Team Member Karen Fink from Schuylkill Haven, PA; and Angelise Stuhl, daughter of George Stuhl, President of Evans sister company DM Transportation. The scholarships were announced at the Evans Network of Companies’ annual agent meeting held on Hilton Head Island in May. Albert L. Evans, Sr. Scholarship winners receive $1,000 per year for each year in college provided they maintain an academic standard of 3.0. The scholarship awards are sent directly to their schools. Samantha Bates also announced the establishment of the Jordyn Agostini Memorial On Angels Wings Book Award. The Book Award was created to honor the memory of Ms. Agonstini, a previous Evans Scholarship recipient, who was tragically killed in a plane crash earlier this year. The inaugural winner of the Jordyn Agostini Memorial On Angels Wings Book Award of $500 is Joshua Thomas, son of Hale independent contractor Stephen Thomas in Columbus, Ohio. The Evans Network of Companies presented a 2011 Harley Davidson Motorcycle to Ernest (Ernie) Newby, an independent driver, in recognition of his safe driving record. Mr. Newby is based at the Jacksonville terminal of Evans Delivery and has been with the company for 11 years. To qualify for the motorcycle grand prize, drivers must have had no accidents or incidents in a calendar year, as well as keeping proper documentation such as daily logs, fuel purchases and miles traveled. IN addition to the grand prize random drawing, monthly drawings are held for prizes including computers, digital cameras and Evans apparel. 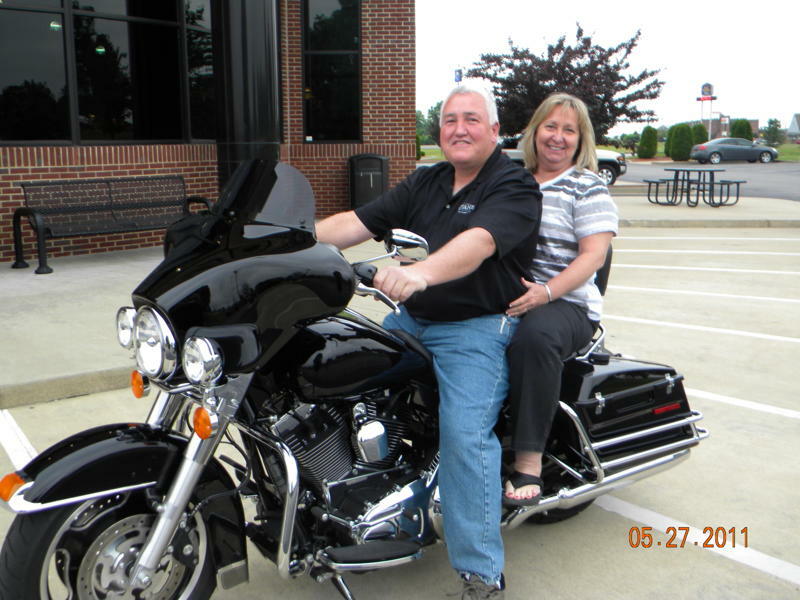 The motorcycle was presented at Harley Davidson Bowling Green, Kentucky to Ernie and his wife Teresa. The couple resides in Callahan, Florida and is expecting their first granddaughter this October. You are currently browsing the Evans Delivery blog archives for July, 2011.